Welcome to Starry Sparkles, a button request site owned by me, flotsam43, or you can call me Justine. 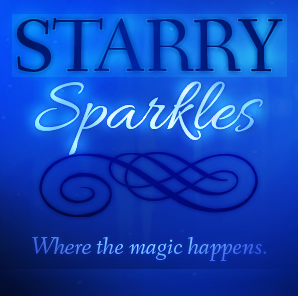 Starry Sparkles was founded on September 23 and was greatly revamped on October 1, both on the year 2012! This site aims to give users a variety of button styles to choose from and a sparkling button to advertise their site! You can also enjoy requesting a button through story mode. Enjoy browsing through the palace! Proceed to story mode? School has now started for me (it's my first day today). I will limit my requests (spontaneous maybe?) to at least one day a week. For now, requests are closed. I'll "try" to finish everyone's buttons at Wednesday. Please bear with me. June 9, 2013 // 12:47 am NST // Laziness is my forte. June 6, 2013 // 10:52 pm NST // Sakebi, itami, ikari, akui..
+ 1 finished requests. I don't know why I don't update when I receive a request. Link swept affiliates! 3 affiliates are inactive so affiliate requests are open. June 5, 2013 // 6:40 am NST // Magi!? Got inexplicably and unexpectedly hooked to the AC. Requests will be done at a slow rate! + 6 finished requests. I've now decided on what the new extra replacing Star Reviews will be. It will be a secret until I've officially launched it. Last but not the least, I'll only be accepting 1 more Multiple Buttons Request. It will be closed when I receive this type of request. Edit: I only noticed now that we're listed at Eurel and Vitals. Thanks, but please do neomail me when you've listed my site for convenience. June 2, 2013 // 3:49 pm NST // Open! I've decided I won't close this site. I love button making as much as I hate school. XD School (for me) starts on June 10 so I'd like to stay positive before then! On that note, requests are open again! There's a catch though. All neomails will be sent to my side account, flotsam43_7_7_7. I've coded the envelopes so all you need to do is click on them while copying the form! My main account is perma'd unfairly so button requests are closed for now. I'm still debating whether to keep the site open or not because of this. If you have any questions about Starry Sparkles or only to me, send it to my side account, flotsam43_7_7_7. I'm really depressed right now. To all those who sent a request but didn't get a reply back, I'm so sorry. My neomails were deleted along with my permanent silencing so I apologize for any inconvenience. May 31, 2013 // 5:02 am NST // Hai! Finished 5 requests. Requests will close tomorrow for some reason. + 1 affiliate, the wonderful Asylum! Affiliate requests are now closed. You gaze up on the sky, and wonder what makes the stars twinkle. They are so pretty, yet mysterious. You have read a book once on why people think stars are so magical. It is because they represent dreams and fantasy. Your eyes flutter open, and you find yourself floating? No, not floating. It is more like you are standing on a thin piece of cloud. Wh-Where am I? - You ask. You, my dear, are in the land where the stars reside. You have made a wish, no? Well, I am here to grant you one. Follow me. - the girl replies. As she is walking, you study her a bit more closely. She has dark wavy hair that is as dark as the night sky. She has a gentle face and warm eyes with a glint of mischief in them. W-wh-who are you? What is your name? - You ask nervously. My name is Justine. I'm the guardian of the stars. It is my duty to grant wishes made by the pure and innocent hearts of people. These wishes makes the stars shine brighter. - She says with glee. Still confused, you look around the very place you're walking through. It's as if you are exploring space just by walking. Ahh... here we are. - Justine says, snapping you out of your dream. A clearer and more vivid picture of the orbs are depicted as you come closer. These are your wish choices. Little star trinkets I call "starlets" are to be made out of the orbs in front of you. A starlet is a symbol of luck, and magic that is a mere guide in fulfilling your wish. Now, go ahead and explore the wonders of these orbs. All you have to do is walk up to one of them and you will be able to tell what unique properties it has to offer. - Justine explains. You nod and walk up to the orbs. Before you could get any further, you hear Justine's voice. Before I forget, you need to agree to some terms before receiving a starlet. Remember what I said earlier? "I grant wishes made by the pure and innocent hearts of people". If you really want your wish, you need to abide by the rules! - Justine says. I make buttons for any kind of sites! The only sites I don't cater are button request sites and sites with stolen content. Credit is mandatory. It can be modified, but it must link back and must be credited properly. I will not hesitate to report anyone found to be breaking the rules. Please mail all forms to my side account, flotsam43_7_7_7 as my main is permanently silenced. All neomails to my main account (even though it says no problem on your part) will not be received. When you request a button, please give me 48 hours to respond. Then, give me 7 days after my response to make your button. If I failed to make it in 7 days, please remind me and your button will be my top priority. If you don't like the button I made for you, please tell me! I'll be more than happy to fix it for you! If you receive the pickup mail, please respond to it. No response is a sign that you will not use the button I made for you. Please fill out each form as best as you can. In the form, put Flowers as the answer to the question 'What's Starry?' if you didn't read the rules.[?] If you really can't fill it out, please request a custom button and make some specifications on it. If I reject your form because of failure to read the rules, you can send another corrected form within 3 days, otherwise it will be fully rejected. If I do reject your request, you may send in another form after 2 days when requests are still open. Please do not request 2 multiple button requests successively. You do not need 6 (minimum) buttons from one site. While I do appreciate the attention, this is just wrong for me. Doing this will result with a stern warning neomail from me. If you still refuse to cooperate, I will reject your request. Are you done? Good, you may now choose which of the four orbs floating before you will be the source of your wish. - Justine eagerly states. You choose based on the characteristics of the orbs. You approach the orb which changes its shape when touched. You approach the orb which changes its colors gradually. You approach the orb with an abstract shape. You approach the orb that multiplies when it is touched. You approach the orb which changes shape as you touch it. There is one way to control it other than continuously touching it. Close your eyes and put your mind at ease. Imagine how your starlet would look like. You close your eyes and ease your mind. You see many possibilities and combinations for your starlet. You decisively imagine your starlet's shape and form. Hover over each border to see if a border is an Original SS Style. These are here for requester's references and not for tracing. + Some borders (Darken, Shadow, Glossy and Stripe) can be applied on all borders. 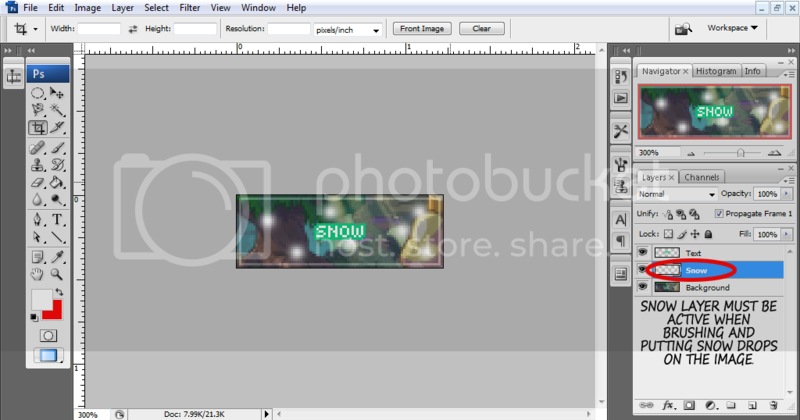 + Small spaced borders (Frame, Rippled, Clutter etc.) would go better with small amount of text. Some animations may seem laggy. Drag them to the address bar to be able to view them with no lag. + Gather and Explode look great together. 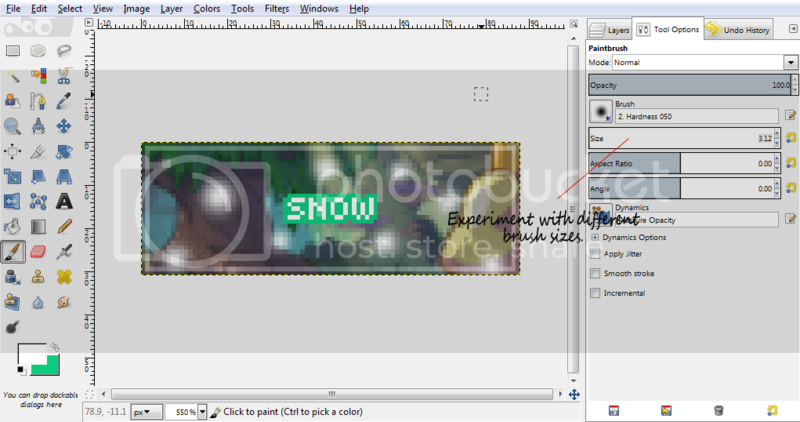 + Snow, Faerie Dust, Petals, Bubble and Confetti can be in front or behind the text. + Petals and Faerie Dust can be a different color if specified. + In Snow, Faerie Dust, Petals, Bubble and Confetti animations, the number can be lessened to make the button look less busy. + Shine can be on the background or on the text. + Laser can be horizontal or vertical. You approach the orb that gradually changes its colors. You know, only one of those colors will form your starlet. You need to choose one and I'll do the rest. You choose your color and Justine begins to work. You approach the one with an abstract shape. This orb is the greatest of them all! You'll never know what shape it'll form even if you try to imagine it. You can specify some things, but it'll still turn out into something else. Want to try? Still puzzled, you choose the abstract orb. You approach the orb which multiplies as you touch it. Just imagine how many starlets you'd like. You can even imagine what your starlet would look like and it'll form into your heart's desire. Be careful though, too many may disrupt the starlet's power. You close your eyes and drift into your imagination. You imagine how your starlets would look like. You wait inside Justine's house while she creates your starlet. Her house is small fit for two only. She has a fluffy cloud theme around her house, making you feel extra comfy. As you lay around and relax yourself, Justine comes in and has finished creating your starlet. Please mail all forms to my side account, flotsam43_7_7_7 as my main account is permanently silenced. All neomails to my main account (even though it says no problem on your part) will not be received. This type of request deals with the requester's taste and perception of the button. All parts are to be dictated by the requester. There are instances, however, that the requester may leave a certain part blank. This means that they trust me to customize that part to his/her liking. This type of request deals with those who have a theme for their site or want a specific theme for their button. The button created will always match the theme given in the form or of their site. Hover over the examples to see their themes. This is a unique type of request exclusive only at Starry Sparkles. This type of request is great for those who want a button but doesn't know what his/her button would look like. Here, the whole button is going to be customized by me. In the form, you can make some specifications that you'd like to have in your button. Sometimes, giving me the freedom to experiment may lead to a more customized button! This type of request deals with those who want more than one button per request. All buttons will be customized by me due to some quality problems. Due to the large amount of buttons created, I'll only be accepting 1 of this type of request per week unless specified in my updates. Buttons will be moved to the portfolio after 5 days of inactivity or if it isn't picked up within that time period. Please do not delete the link back. Neomail me if your button was deleted from the Pickup list and I'll add it back. These are the most recent buttons I've made. If you like their animation and design, feel free to include their name in the 'Specifics' part of the form and what part of the button you liked. Want to see the full portfolio? Click here! This section tells the story of how Starry Sparkles was formed. This is a handy list of questions that may have already answered your own question. This extra is currently under construction. Be sure to check back soon! Supernovas are stars that have exploded due to loss of energy. These are the retired buttons that used to advertise Starry Sparkles. This is where all the awards and feats of Starry Sparkles could be found. It makes us all feel proud! Here are some guides on how I make my buttons. Send me a suggestion as to what guide I should make. Ever wonder how Starry Sparkles came to be? You came to the right place. This section will tell you all about how Starry Sparkles began! It all started with a pet application. I was going to request a button on a button request site for my pet app (they make buttons for pet applications), but I failed to read the trick word (I literally read the rules without even seeing it) which led to rejection of my request. I still wanted a button for my application, so I tried asking the HC if they know how to make buttons. One user directed me to Soroptimist. I then found Lucy's Button Tutorial. Following the tutorial, I made the button on the left. I was super proud of it, so I continued making buttons for me and my guild back then. As I was scouring the PC, I came upon a board saying that they want their applications to be reviewed. I volunteered to review it and at the end, I offered to make her a button. The end result is the button at the right. She then told me to open a button request site because of my button making skills (I was doubting how good I am at that time). And that was how Starry Sparkles was born. I hope you enjoyed the story. Question not answered? Neomail me! Please make the title of your neomail, "Star Question". Q : Do you take requests for sites that are under construction? A : Yes. Under construction is fine by me! Q: Do you take requests for sites that are non-existent / no content? A : I'm sorry, but no. I will not be sure if you will use my button since it's not yet created so I will not make buttons for non-existent sites. Q : Can images that are non-Neopet related be used on your buttons? A : This just depends on the image. It must be appropriate for Neopets. If you'd like, just slap it in a petpage and I'll see what I can do. Q : Help! My neomails aren't going through! What should I do? A : Because of the glitch, linked neomails sometimes don't go through. Please don't put the full URL. If this still doesn't solve the issue, kindly put the form on a petpage. Q: What program do you use in making your buttons? 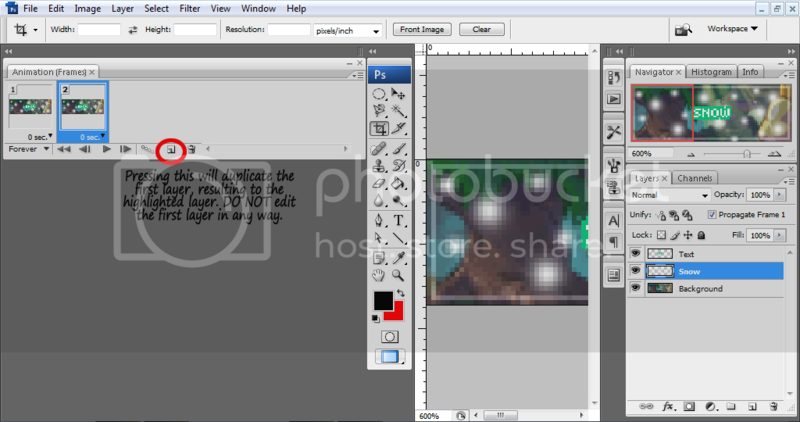 A: GIMP and Photoshop CS3 depending on the animation. I usually edit images in Photoshop. If the animation is simple, I use GIMP. When it's complicated, I use Photoshop. Q: How many multiple buttons requests can I request per site? A: One only per site. As much as I love the attention, this is exhausting on my part. Coming up with different designs for one multiple buttons request is already a challenge to me. Please refrain from ordering 2 multiple buttons request for one site. Q: What are we supposed to put in the What's Starry question if not Flowers? A: Anything! Anything but Flowers. Please do remember that simply putting not flowers is still against the rules. The word itself on that specific question is a trigger for me. Be creative! Q: Why do you not accept not Flowers as an answer to your trick? A: Simply because this is another way of bending the rules. Just because you put not before Flowers doesn't erase the word Flowers. Since it says "to put Flowers when you didn't read the rules", the word itself, no matter what you say, on that specific question is a trigger for me. This is simply bending the rules and I'd appreciate it if you didn't do this. Q: Can I use one of your SS Exclusive Borders/Animations for my site? A: Yes, but you must leave visible credit somewhere around the site. If I see one button with my own animation/border, I will first send out a warning. If you still refuse to credit me, I will not hesitate to report you. These are the stars that were previously used to advertise Starry Sparkles. Reached 100 pageviews on November 9, 2012! Thank you! Reached 250 pageviews on November 20, 2012! That's a short while! Reached 500 pageviews on December 11, 2012! Thanks for your support! Reached 1000 pageviews when I was on hiatus (January 4 to February 4, 2013). How did that happen? Reached 2000 pageviews on April 13, 2013! I really appreciate your support guys! Before you use any of these resources, please take a gander at the rules. Text Link: Textures on buttons by Starry Sparkles. You may edit the resources to your liking. You may recolor them to match your preferences, add text to the bases and many more, but remember to credit. Do not claim these resources as your own or redistribute them at your site. If you have any suggestions, feel free to neomail me and I'll see what I can do. These textures are best used with the modes Multiply, Screen, Overlay, and Soft Light. 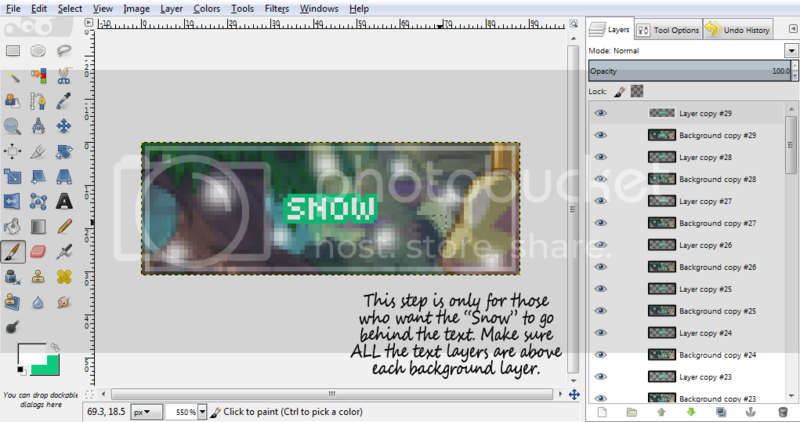 A step-by-step guide on how to make the Snow animation. 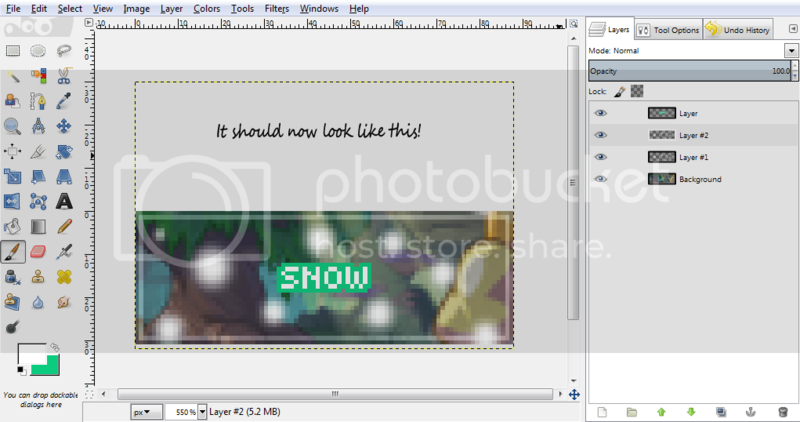 A step-by-step guide on how to make the Snow animation using the free program, GIMP. Have a suggestion for a guide? Feel free to send in your suggestion below. Making the "Snow" animation has many different methods, but I think it's time I make a guide about this since 3 people have already asked me how I make my "Snow". I use Photoshop CS3 for this, but feel free to incorporate this with other PS versions. This is not available in GIMP though. This guide depends on both the text and image guides. Drag the images to the address bar to see them in full view. I'll be using this image throughout the guide. 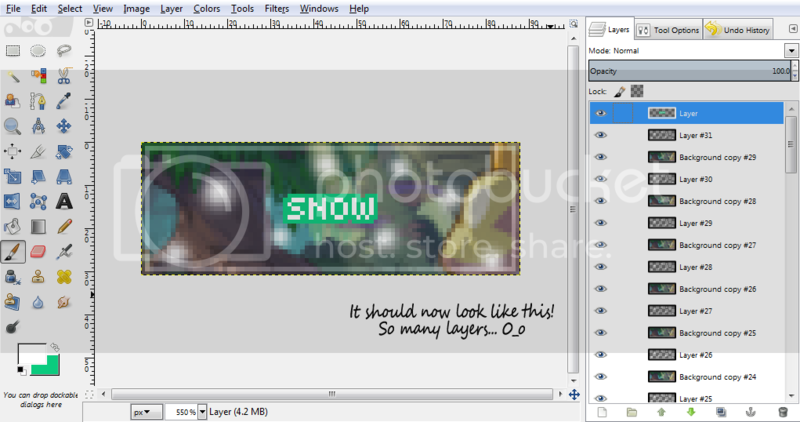 First, open a new layer and name it as "Snow". Make sure that this layer is below the text layer. Next, select the Brush tool and set the "Hardness" to 0%. 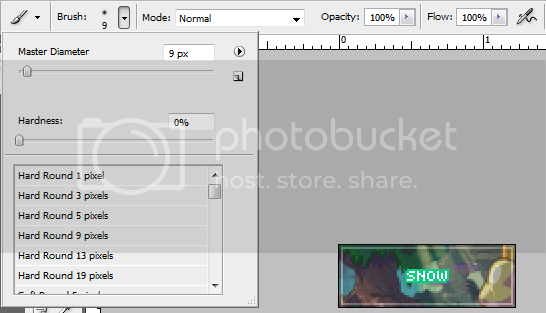 Change the Master Diameter to 9px. Click on 4-8 spots on your button. 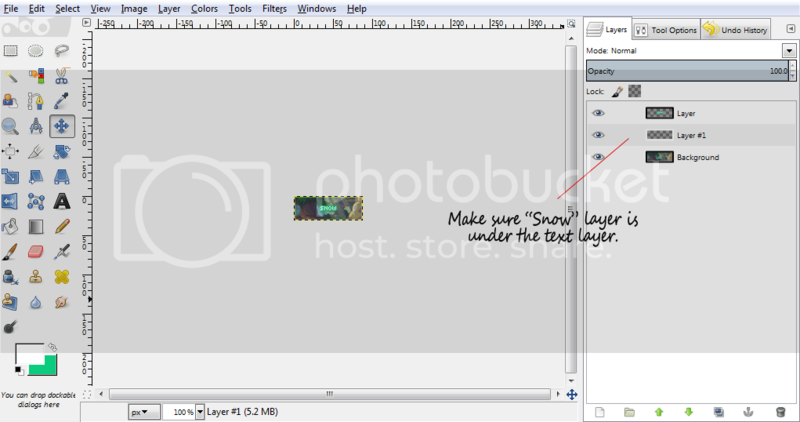 Make sure that the "Snow" layer is active. Change the Master Diameter of the Brush to 5px and click on 7-11 spots on your button, still making sure "Snow" layer is the active layer. Click on one spot at the bottom part of your button as a marker. Merge the duplicate and the original layer. Bring up the "Animation" palette. Make a new layer, like so. 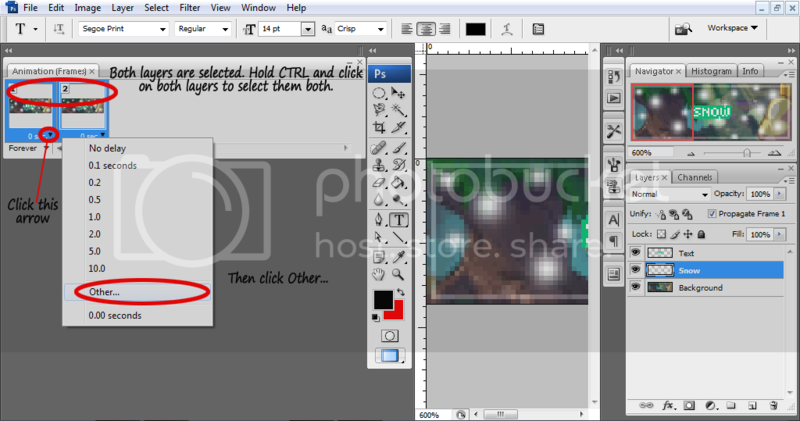 Select both layers and click on the arrow beside "0 sec". Click on other and a window will show up. Set it to 0.07 seconds. 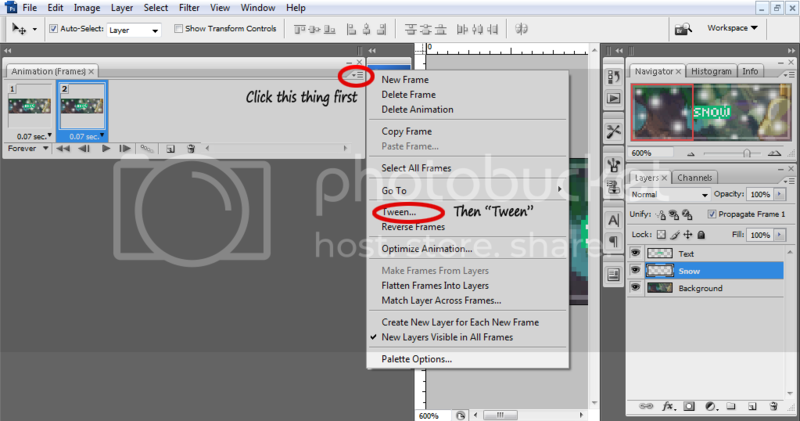 Making sure that the second frame is active, click on the highlighted part below, then select "Tween". A new window will show up. Retain all settings except "Frames to Add". Set it to 30. Congratulations! You have now made "Snow"! 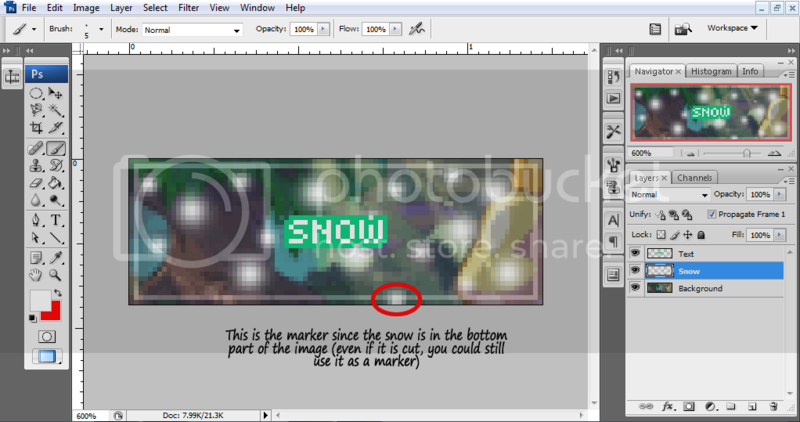 Be sure to credit Starry Sparkles if this wonderful guide has helped you make "Snow"! Feel free to neomail me for suggestions and questions about the guide. Snow animation tutorial by Starry Sparkles. This is an extension of the first guide. This guide has the same outcome but with a longer process. This is exclusive to GIMP users. This guide depends on both the text and image guides. Drag the images to the address bar to see them in full view. I'll be using this image throughout the guide. First, open a new layer and name it as "Snow" (or just leave it in its default name). Make sure that this layer is below the text layer. If you want the "Snow" to go behind the text, do not merge the text layer to the background. The "Snow" will always go in front of the text when the text is merged with the background. Next, select the Brush tool. Create 7-12 snowdrops with variety of sizes. 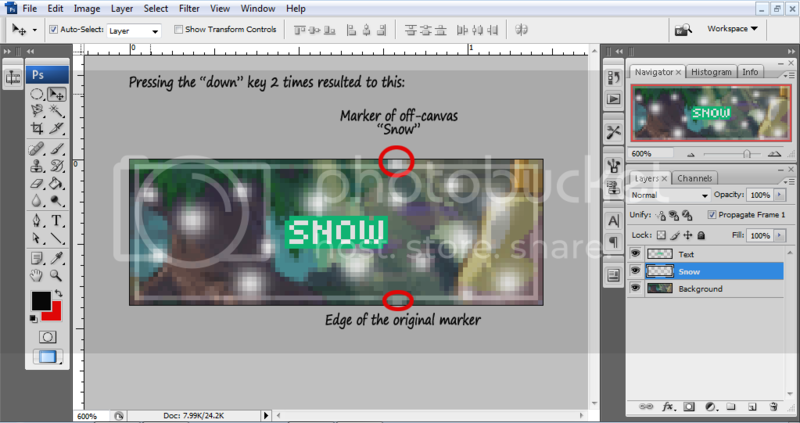 Duplicate the "Snow" layer and move it upwards, using the layer boundary as a guide. 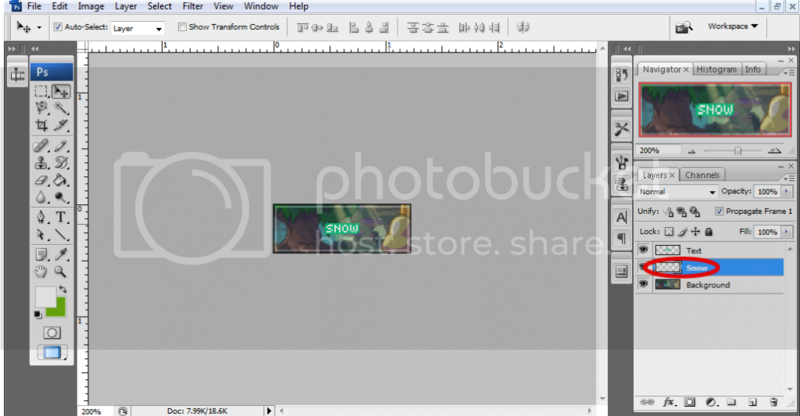 Stop when the bottom part of the layer boundary is outside the image canvas. 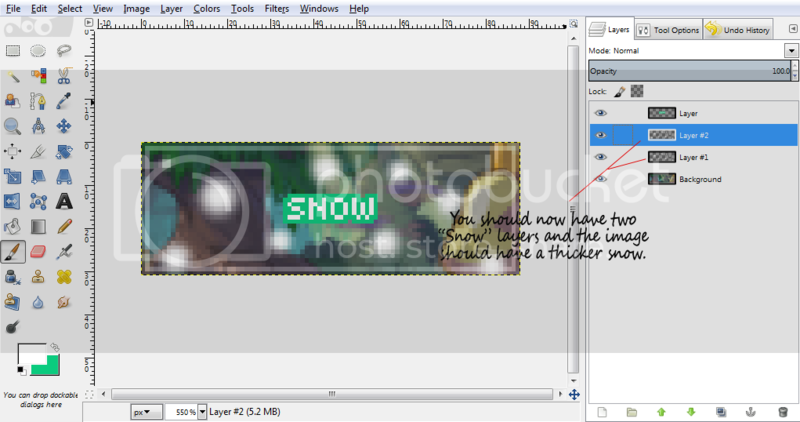 Merge the duplicate "Snow" layer down with the original "Snow" layer. 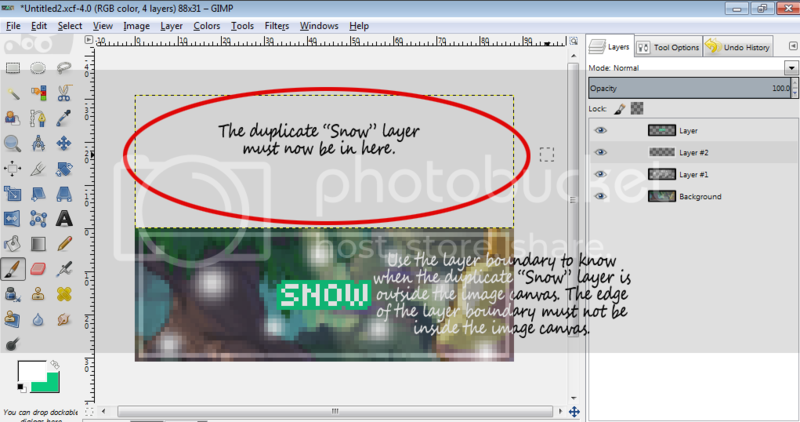 Duplicate the "Snow" layer again. Nudge the duplicate 1 pixel downwards. 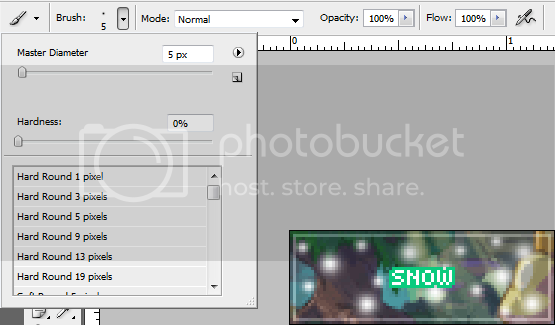 Repeat this (duplicate then move) until the top edge of the layer boundary has a 1 pixel gap from the image canvas. Duplicate the background layer and move it under a "Snow" layer. 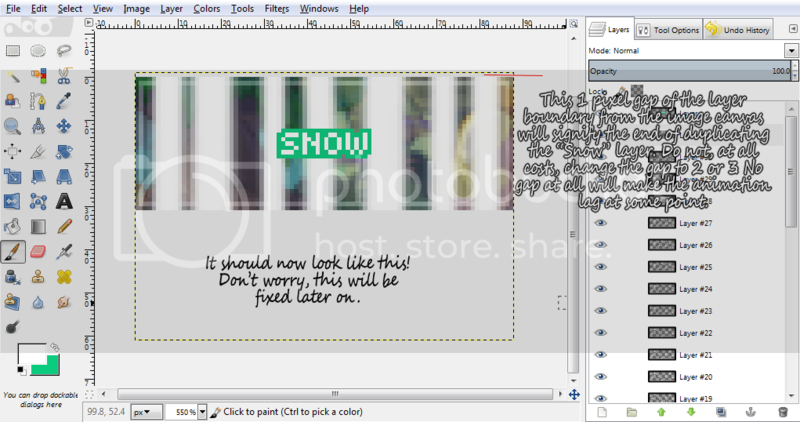 Repeat until all "Snow" layers have 1 background layer underneath. 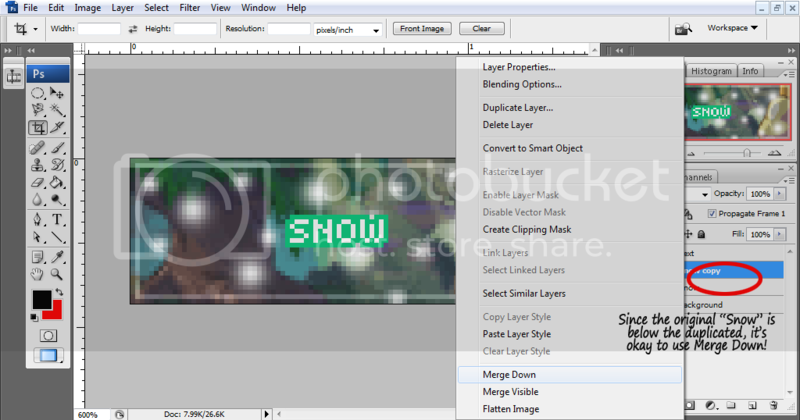 Merge down (not merge visible or flatten) all "Snow" layers, making sure the background layers are all visible. Skip the next two steps if you've already merged the text layer with the background layer. 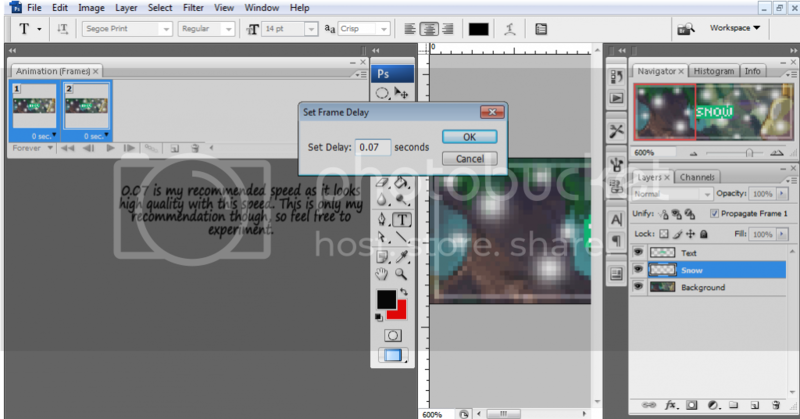 Duplicate the text layer and put the duplicate above each background layer. 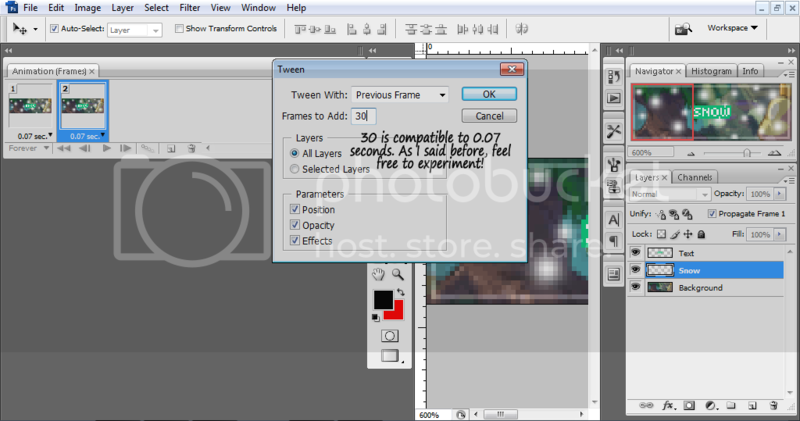 Repeat until all background layers each have a text layer above them. 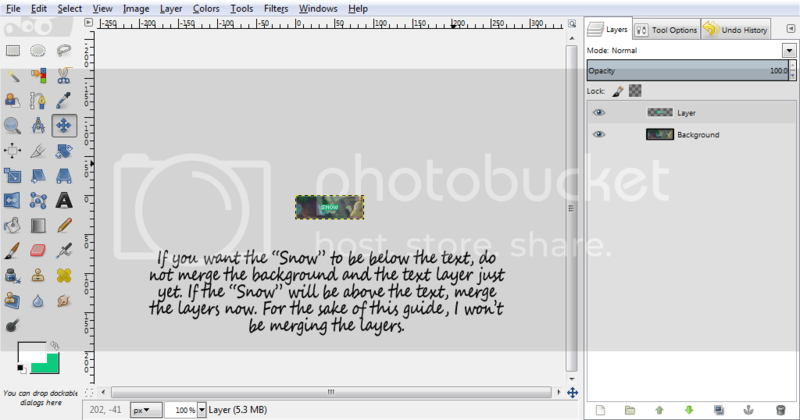 Merge the text layers with the background layers underneath them. Congratulations! 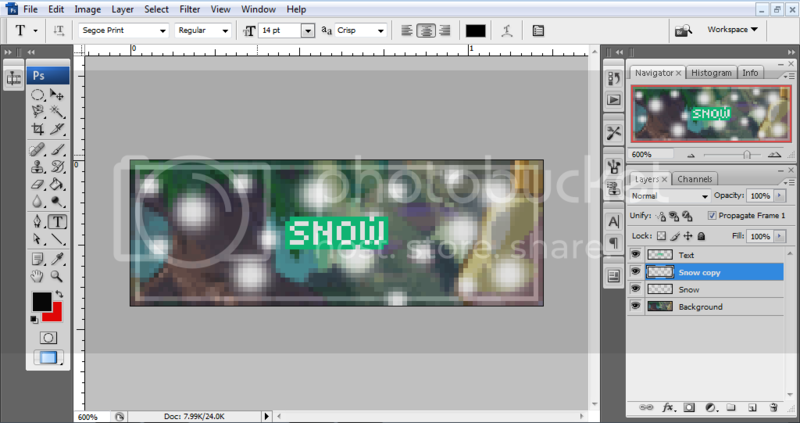 You have now made "Snow" using GIMP! 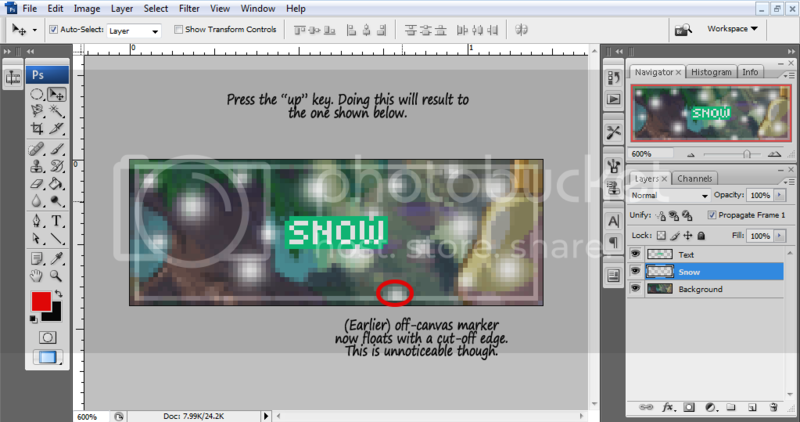 Be sure to credit Starry Sparkles if this wonderful guide has helped you make "Snow"! Feel free to neomail me for suggestions and questions about the guide. Affiliates / open / Apply? Insanity, Dark Light, Just Julie. Button Burst is a button request site owned by the very kind and gentle Millie. Her style of button making is unique and is very eye-catching. I would definitely recommend her to someone looking for a cute button! I may have surpassed the number of buttons Millie has done, but I still look up to her. I'm proud to be Button Burst's sister site! Bold links are directories that recommends Starry Sparkles. Did you list me? Neomail me! + Envelopes, Send in your request sign, request status/speed resources & wavy shine tutorial © The Lunch Box. + Bullets (diamonds) © Details. + Back buttons © Bedazzled. + Textures used on buttons © Bedazzled and Jubilee Resources. + Sparkle 3 is an animation from Saranghae's Tutorial. + Story mode is an original idea by Turnip. I have received written permission to use it. + Quote used (All stars are created....) is an original quote by me. + Please neomail me if there are things I forgot to credit. things that are out of place (i.e. Original SS animations/borders that aren't original) or if you ranked/recommended Starry Sparkles. Starry Sparkles & all contents © Justine. All stars are created equally and have the same role; to light a planet. Their only difference is how brightly they sparkle in the clear, night sky.